In chapter 9 of The Great Gatsby, our protagonist Nick Carraway comments that New York, and West Egg in particular, remind him of the classic painting by El Greco. Take a look at this vivid presentation, which will allow students to discuss and/or write their responses to a dramatic work of art. Guided questions will help your class draw the same connections that came to Nick's mind at the end of F. Scott Fitzgerald's masterpiece, The Great Gatsby. The zip file includes both a Notebook file for SMARTBoard users and a Powerpoint file for everyone's easy use. Want more materials to pull your students into their study of The Great Gatsby? 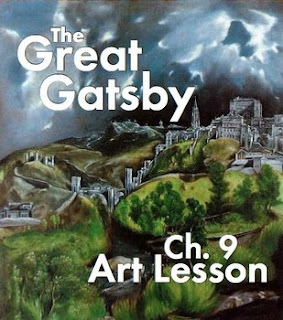 How about an entire FOUR WEEK unit of Gatsby lessons at a budget price? Click HERE for the Entire Great Gatsby Unit Plan. This is a HUGE savings over purchasing all items individually; the bundle also features MANY items not sold separately. Check it out!